The George Washington University’s standing among premier research institutions is on the rise, according to an annual survey by the National Science Foundation. 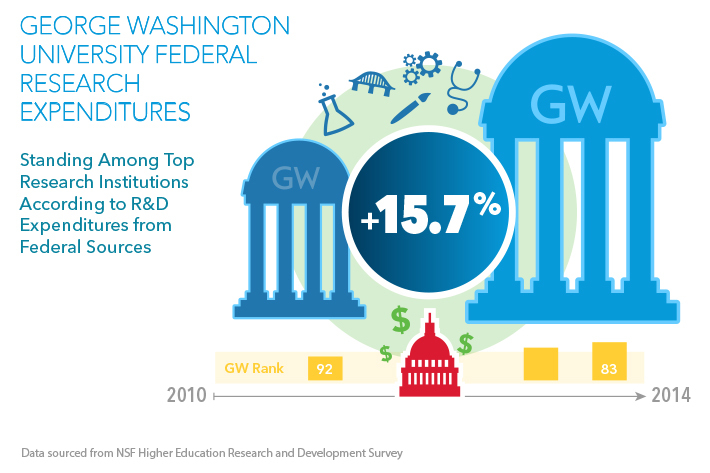 The data show that GW’s federal and overall research expenditures have increased by more than 15 percent since 2010. Expenditures represent real money spent on research efforts originating from federal grants or other external sources as well as GW’s own investment. The growth points to a significant increase in the university’s standing among top research institutions, according to analysis by the Office of the Vice President for Research. Federal research expenditures increased by 15.7% and GW's standing among research institutions jumped from 92nd to 83rd place between 2010 and 2014. While the average standing of comparable “market basket” institutions decreased between 2010 and 2014—GW jumped from 92nd place to 83rd place in total federal expenditures over the same period. 2014 marks GW’s highest position in the survey to date. The university submits data to NSF annually. GW’s rise is particularly notable, considering NIH’s budget challenges in the last few years. The world’s largest biomedical research agency has been increasingly selective in funding decisions since the 2013 compulsory budget cuts, known as sequestration. George Washington President Steven Knapp made a priority of expanding and diversifying the university's reach as a research institution when he was hired in 2007. GW’s upward trend can be traced to a commitment to transforming the university—from attracting expert faculty and erecting the 500,000-square-foot Science and Engineering Hall to supporting global research efforts in more than 100 countries and outpacing peers in recruiting women faculty and students who are underrepresented in the fields of science, technology, engineering and math. In collaboration with GW Deans and faculty leaders in their schools, OVPR has also made strides in key research initiatives such as the Global Women's Institute, the Institute for Neuroscience, the Computational Biology Institute, sustainability, urban food studies, autism and neurodevelopmental disorders, and the GW Cancer Center, among others. Supporting faculty and researchers as they seek external funding has been a top priority of OVPR since Dr. Chalupa joined the university in 2009. Under his direction, the Research Enhancement Unit was established and has expanded to include consultative and editing services geared towards developing more competitive funding proposals. In addition, OVPR sponsors events such as “Faculty Research Salons” to facilitate cross-disciplinary collaboration and “Boot Camps” to train faculty and staff in grant proposal development and grant management. Streamlining administrative processes and new technology also plays a key role in ensuring the success of GW researchers. One example is the OVPR and Division of Information Technology collaboration to create the Principal Investigator Dashboard (PI Dashboard). This online tool, launched in 2013, organizes financial and other information, so that researchers have real-time access to data that helps them make better-informed project decisions.